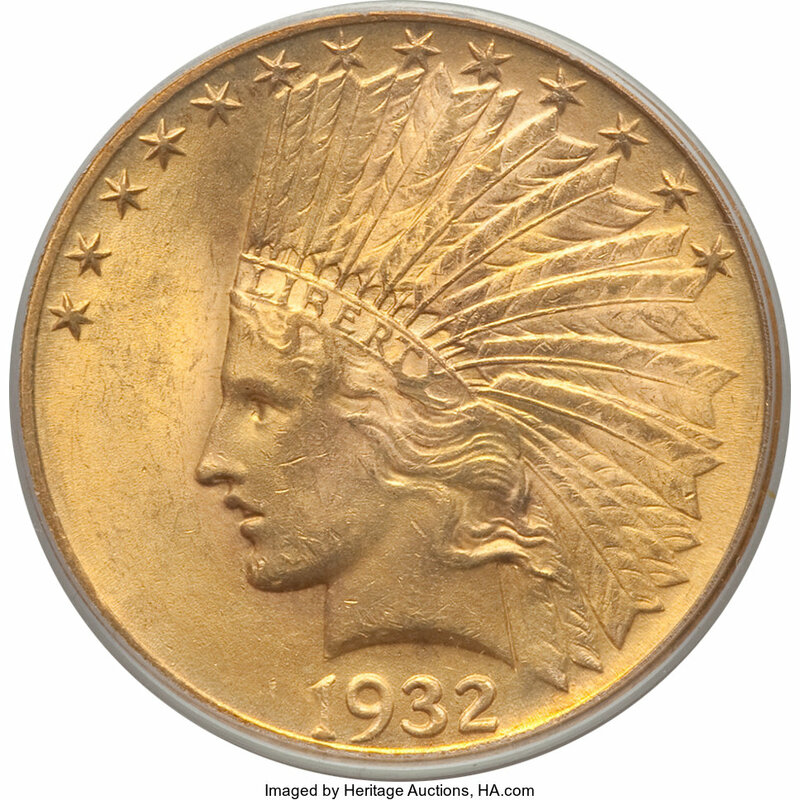 $10 Indian Head eagles, struck from 1907 through 1933, were designed by world-renowned sculptor Augustus Saint-Gaudens, whom President Theodore Roosevelt had commissioned to redesign several United States coin series. Unfortunately, Saint-Gaudens died in 1907 before having the opportunity to complete his coveted numismatic mission and thus only this and the eponymous $20 Saint-Gaudens double eagle are the only coins that were ever struck with the famous artist?s designs. $10 Indian gold eagles are generally classified as two subtypes: Variety 1, struck 1907-1908, has no motto (?IN GOD WE TRUST?) on the reverse while Variety 2, produced from 1908 through 1933, carries the motto on the reverse. Most $10 Indian gold eagle are relatively common in circulated grade and lower Mint State levels. There are, however, a few exceptions. These include the 1907 Wire Rim with Periods, 1907 Rounded Rim with Periods, 1911-D, 1913-S, 1920-S, 1930-S, and 1933, which range from rare to extremely rare, depending on the specific date and/or grade in question. Among these, the 1933 Indian $10 eagles are the rarest. While a respectable sum of 312,500 were minted only a few survive as the vast majority were melted under Executive Order 6102, which was issued by President Franklin D. Roosevelt in April 1933 and banned the production of gold coinage.